What a pleasure to re-read a book after some 8 years and find it every bit as entertaining. My Delhi book club was bang on trend when we read this book in late 2008, and I thoroughly enjoyed it at the time. We all did, I seem to remember. In the intervening years, the book club has changed its membership totally – the downside of being a “lifer” in a largely ex-pat group – and in our new avatar we are reading this extraordinarily entertaining book again. 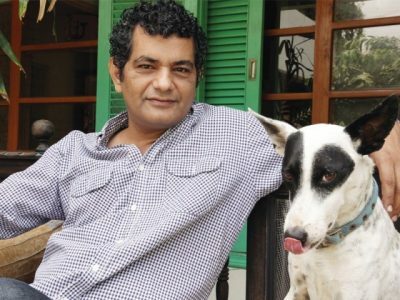 Mr. Hanif is a fine writer, cleverly weaving history with fiction and huge dollops of quirky imagination, to bring us an absorbing story of the last days of the Pakistani President, Zia ul Haq, who was killed in August 1988 when his official plane, Pak One, blew up in flight, killing everyone on board. 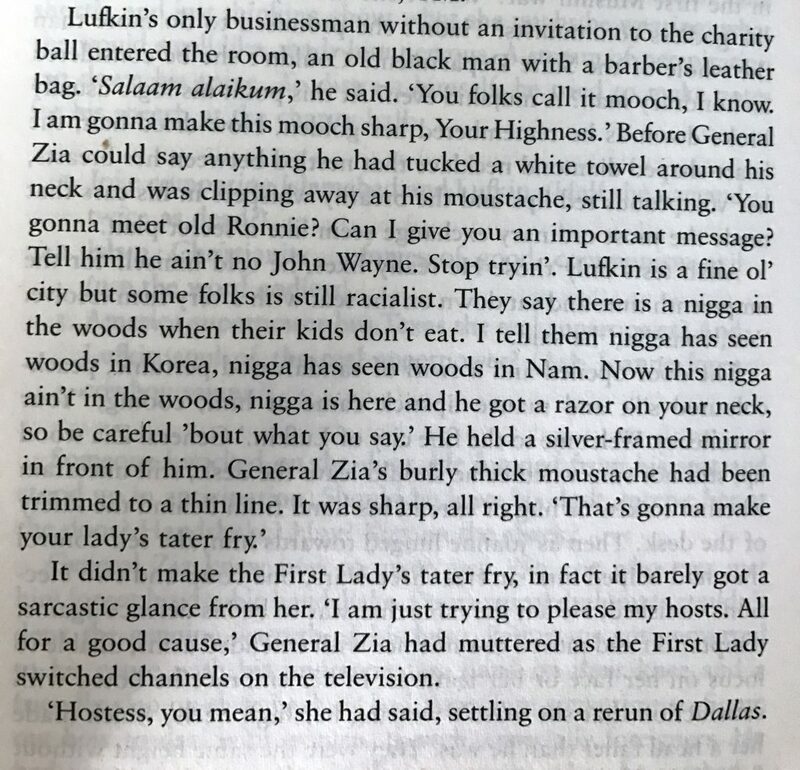 What Mr. Hanif has done is take the main protagonists – Zia, his wife, the American Ambassador, the generals – and mix them up in a nice masala mix with fictional characters – Under Officer Ali Shigri, the wonderful Baby O, Brigadier TM, and the minor but colourful character of Uncle Starchy. 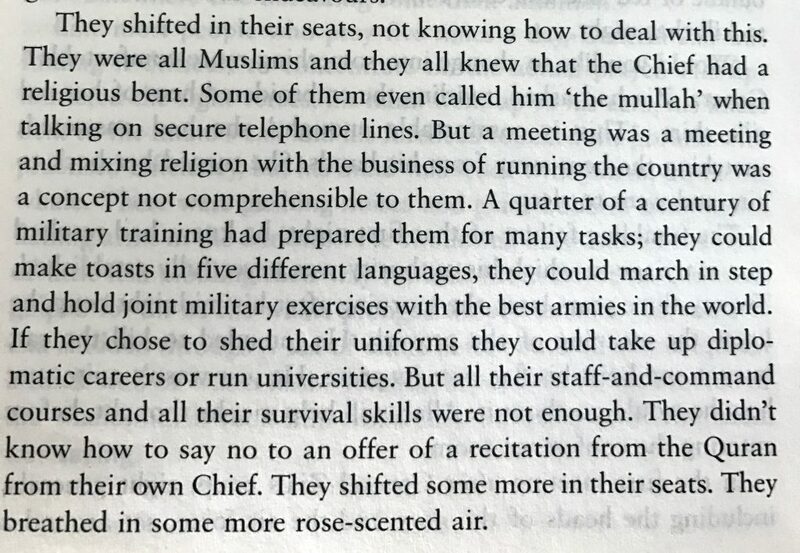 The novel is an indictment of the growing Islamisation of Pakistan, and the Army in particular, by an unpopular man, who supported the Afghan Muhajaddin and steamrollered his own country along an increasingly Islamic path. To explain the explosion on board Pak One – still an unsolved mystery – the author has a case of exploding mangoes loaded onto the plane. But since we know from the very first moments of the book that the plane will explode – well, yes, obviously, we also know that fact from history – there is no plot spoiler, just a zany unravelling of the tangled web of actions and ambitions and treachery that led to the inevitable dénouement. A great read, with some equally great writing and lots of laugh-aloud moments. 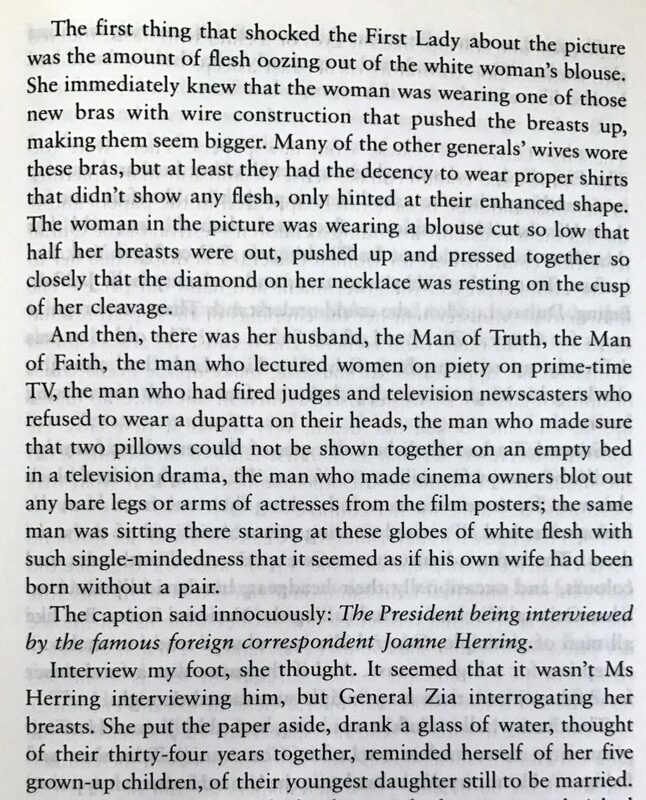 Another great laugh-aloud moment is when Brigadier TM is faced with 200 or so hastily assembled widows for a presidential photo op when Zia will give them alms. How can men search burqa-clad, face-covered, head-covered women? Especially when the TV crews are already in place. TM makes an on-the-spot decision that, Presidential photo op or not, there can be no “ninjas whose faces I can’t see,” so all the widows in burqas are ordered to leave the queue. Their loud protests and offers to remove their burqas are ignored and the poor about-to-be-given-presidential-charity widows are unceremoniously bundled off. The First Lady is a great character. There are dark moments, when we encounter the torture and terror that keeps much of the country in line. 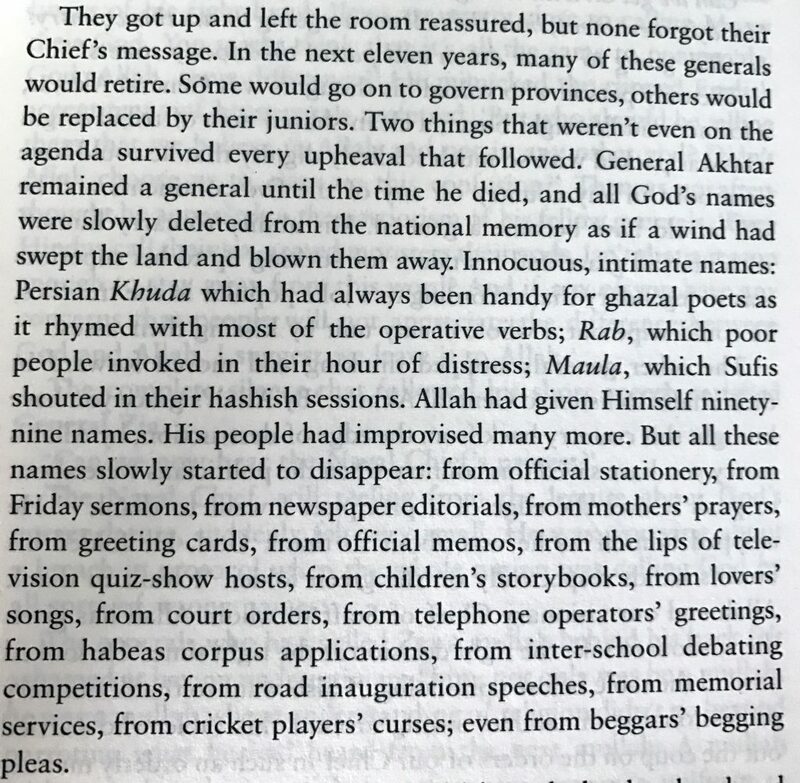 But overall, there is a zany streak running through this novel, pushing us on – through the unbearable heat of a Pakistani summer, through a dreadful 4 July party, towards that moment when the case of mangoes explodes. Read this book to brush up on recent political history, to get a feel for the way Pakistan was, and – in my case – to yearn to be in that adorable cottage on Shigri Hill, with the clouds drifting through the picture windows and the views of K2. If you would like to read this award-winning novel, you can order your copy right now. Tagged A Case of exploding mangoes, Delhi, Islam, Mohammed Hanif, Pakistan, Zia ul Haq.